Newcastle University Sailing and Yachting Club were the overall winners of the University Sailing Sustainability Challenge 2018-19, presented by BUSA President, Peter Saxton and Kate Fortnam, Campaign Manager, on behalf of the RYA and British Marine’s joint environment initiative ‘The Green Blue’. Swansea University Sailing Club clinched second place, and Dundee University Sailing Club, the University of Sussex Sailing Club and the University of East Anglia Sailing Club were in joint 3rd place. 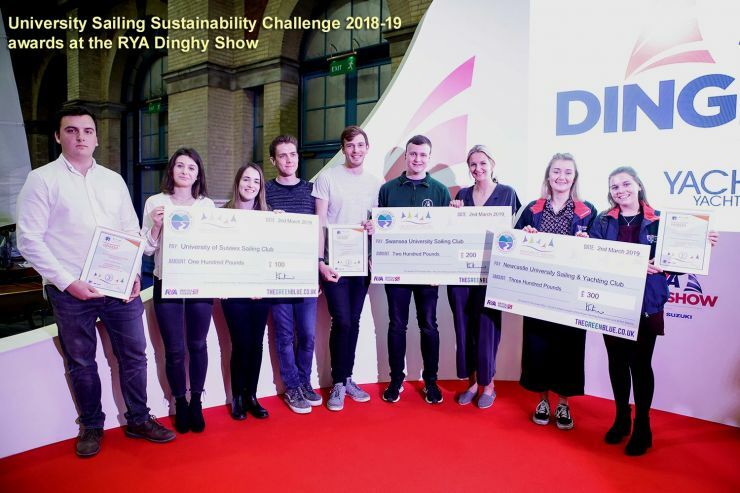 After six months of competition, the successful students from NUSYC today claimed their prize on the main stage at the RYA Dinghy Show, in association with Yachts & Yachting and Suzuki. Having clinched first place by achieving the most sustainable actions in the challenge, they received the competition’s £300 top prize along with their certificate of congratulations. Environmental problems like waste disposal, climate change and the pollution of our marine habitats affect every human, animal and nation on this planet. Environmental issues are also a hot topic in lecture halls and common rooms across the UK. Set up by The Green Blue and supported by the British University Sailing Association (BUSA), the University Sailing Sustainability Challenge provides an ideal platform for university sailors to demonstrate how achievable sustainable boating can be to the wider boating community. Swansea University Sailing Club clinched second place and were awarded a £200 prize and in joint 3rd place was Dundee University Sailing Club, the University of Sussex Sailing Club and the University of East Anglia Sailing Club who each received a £100 prize. Representatives of the university sailing clubs were invited onto the main stage at the RYA Dinghy Show to have their awards presented by Campaign Manager for The Green Blue, Kate Fortnam, and Peter Saxton, President of BUSA. Kate congratulated the universities for their efforts and achievement with their certificates and prizes. She said: “It’s in everyone’s interest to protect the natural environment that supports our recreational boating activity. That’s why it’s so rewarding to see these University Sailing Clubs once again commit to making their sport as environmentally sustainable as possible. To recognise the achievements of the winning clubs, certificates were presented to the Sustainability Officer for each club. Their role was to organise, encourage and lead their club through the challenge to successfully complete a number of sustainable boating actions. As part of the challenge, a set number of sustainable actions had to be achieved and evidenced by competing university sailing clubs. These included performing an environmental audit of their sailing venue to identify and improve areas that can be made more sustainable, ensuring all their members use reusable water bottles as opposed to one-use plastic bottles, installing an oil/fuel spill kit at their sailing venue to clean up accidental spills when refueling, and demonstrating ‘check, clean and dry’ best practice to minimise the spread of alien species around UK waters. The Green Blue has teamed up with BUSA to invite all UK University Sailing Clubs to enter into next year’s University Sailing Sustainability Challenge 2019-20. If you know or are part of a university sailing club that is interested in getting involved or want to find out more about the challenge, email Kate Fortnam, The Green Blue’s Campaign Manager or call 023 8060 4227. You can cheer on next year’s University Sailing Clubs through the sustainability challenge by following @thegreenblue on Twitter and Facebook.